There was one work which stood head and shoulders above the rest at ‘Utopia Station’, the disorderly tail­piece of the most recent Venice Biennale. It was a ﬁlm, which showed a strange and wonderful journey through the night and day of a dilapidated Eastern European city with a man in a taxi – Maﬁa boss or artist? – who offers a detailed account in an incomprehensible language to someone who remains out of shot. Buildings and streets are reduced to ­rubble, broken-down means of transport edge their way through, stray dogs appear and disappear, little huddles of people stand around ﬁres. So far the ﬁlm is showing the ­clichéd image of a city in a ­former war or disaster area, with one crazy difference: the facades of the houses are ­painted in vibrant ‘colour ﬁelds’. Is this the work of a house painter on the loose? Is it the result of a ‘percentage for art’ programme that has spun out of control? I didn’t have a clue, because as usual at such exhibitions there was little background information and the subtitling wasn’t functioning – on that day at least – so with affection and bemusement I stored away this short ﬁlm on my hard disk. Titled Dammi i colori (‘Give Me Colour’), the ­creator of this work was Anri Sala, an Albanian artist in his thirties who has already pro­duced a sizeable oeuvre. Eight of his projects from 2001 to 2004 are described in detail in the publication: Entre chien et loup / When the Night Calls it a Day / Wo sich Fuchs und Hase gute Nacht sagen, beautiful expressions for what is also known as twilight. This is the time when the day transforms into night, and time and space briefly seem to dissolve: an in-between time that is typical for Sala. At this time, our imagination goes into overdrive and we confuse a dog for a wolf. In the catalogue for the 2003 exhibition ‘In den Schluchten des Balkan’ (‘In the Gorges of the Balkans’), the Albanian curator Edi Muka brands Balkan artists like Sala the ‘new proletarians of the art world’, artists who still have nothing to lose and are not yet shackled by the international art scene. That Sala is the exception to the rule is demonstrated by the list of internationally renowned gallery owners, his biography, and the impressive line-up of writers in the book that ap­peared to accompany his exhibitions in Hamburg and Paris. Published in both English / German and English / French editions, besides texts by the exhibition’s three (!) curators, namely Laurence Bossé, Hans Ulrich Obrist and Julia Garimoth, the catalogue also includes essays by a number of eminent professors in the ﬁelds of philosophy, memory and psychology, and art history, such as Jacques Rancière and Israel Rosenﬁeld. Sala’s rising star in the constellation of international art is ratiﬁed by the scenario for a ﬁlm, which the star artist Philippe Parreno wrote for Sala. 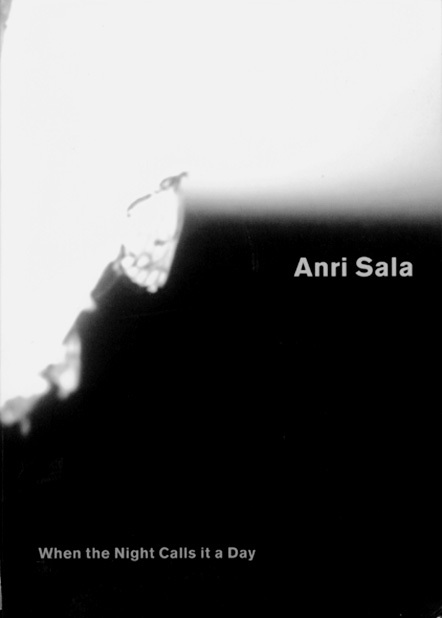 Parreno, who claims never to have seen a work by Sala and intends to keep it that way for the time being, has created a scenario for a mini-feature ﬁlm based on conversations with Sala, a ﬁlm that Sala might make in 2010. Parreno, who became known with Pierre Huyghe with the launch of the virtual character Annlee, who everyone could ﬁll out artistically, totally misses the point with this scenario. Sala is ­obviously not a ‘shell ﬁgure’ like Annlee, though his work does invite a whole range of interpretations. Molly Nesbit, co-curator of ‘Utopia Station’, for example, unquestioningly accepts the story by the mayor of Tirana, Edi Rama, formerly a painter, who has decorated the facades with a patchwork of colours at a furious tempo in anticipation of future (infra-) structural improvements to the city. By way of Wittgenstein, Nesbit becomes engrossed in the limitations of the knowledge of consciousness on the basis of colour (does your red mean the same as my red?) to conclude that colour in Tirana is ‘real’, and that aesthetics can again become politics. Nesbit puts forward the fact that the mayor has not exploited Sala’s ﬁlm Dammi i colori, the ﬁlm that was shown at the Venice Biennale, to promote Tirana as evidence of his sincerity. A more interesting and more controversial interpretation of the same work is provid­ed by the two young French philosophers, Alexandre and Daniel Costanzo, in their essay ‘The Politics of Colours’. They prick the mayor’s Utopian coloured bubble in the open­ing paragraph, then they ana­lyse the fables of the city, the colours, politics and ‘cinematographic’ ﬁction. To begin with the latter, they make a distinction between ﬁlm as a traditional political dream factory and ﬁlm as a narrative machine, which are brought together in Sala’s ﬁlm. Mayor Rama talks enthusiastically about the creation of a new society in which people form a close-knit community. But Alexandre and Costanzo note that Sala only allows the mayor to have his say; the city’s ­inhabitants have none. How democratic is a mayor who single-handedly decides the appearance of an entire city, and only then gauges the opin­ion of its inhabitants? And how does this stand in relation to the socialist and/or totalitarian belief in the engineerable society that has now been declared bankrupt? And if the colours project is a re-conquer­ing of the public space over the space claimed by individuals, then what does that public space signify? Is it not in fact a feature of democracy to allow unplanned spaces which can be claimed by residents? The designation ‘new proletarian’ turns out to be not wholly incorrect for Sala, if you bear in mind that he retains an old-fashioned belief in the power of art, while simultaneously maintaining an instinctive awareness of the powerlessness of the artist to bring about real changes. Sala’s work is politically engag­ed, without remaining stuck in the pamphlet-focused stance of much of the other art that was shown at ‘Utopia Station’. The clever thing with Sala’s methodology is that he creates space to prompt questions about the reality of the ﬁlmed images using cinematographic and artistic means. This results in strangely beautiful and moving works, which echo in your mind for a long time. The publication is justiﬁably conceived as a polyphonic commentary on the work of a multifaceted artist.